In my day job as a Business Development Manager at the University of Glasgow, I’m always looking for good case studies on the benefits of business-university collaboration. One industry sector that has benefited enormously from university expertise is the computer industry. A fascinating example of this is a project which dates back to the very start of the industry in the UK. It involved a collaboration between catering firm J Lyons & Company and the University of Cambridge to develop the first computer specifically for business use. Amazingly, this landmark project in the history of technology grew out of a simple requirement for the company to more accurately monitor sales of cakes throughout its chain of teashops. The project started in May 1949 when the Lyons board took the decision to build an electronic computer to serve the company’s growing data processing needs. This bold decision had been prompted by a fact-finding visit to the USA by two senior managers of the company, Raymond Thompson and Oliver Standingford, two years earlier in May 1947. Despite the mundane nature of the company’s products, Lyons had a refreshingly forward-thinking attitude to business and had pioneered innovative management techniques in its quest for office efficiency. Thompson and Standingford’s original remit had been to investigate wartime developments in office systems and equipment but this was extended to include computers following tantalising snippets of information that were beginning to appear in the press about US developments in electronic computation. During their trip Thompson and Standingford met with Herman Goldstine, a leading figure in the US computer research community, who informed them of efforts to develop a computer taking place much closer to home at the University of Cambridge. The Cambridge group was led by the pioneering computer scientist Maurice Wilkes. Wilkes had been one of a handful of non-US academics invited to attend a series of lectures held at the University of Pennsylvania’s Moore School of Electrical Engineering in the summer of 1946 to disseminate the results of US government-sponsored research into electronic digital computers. Top of the agenda was one of the Moore School’s own projects, a radical new computer design based on a stored-program architecture. This was the breakthrough which would turn electronic computers from sequence-controlled calculators into powerful machines capable of carrying out all manner of complex tasks. Fired up by what he had seen and heard on his visit to the US, Wilkes began working on his own version of this design during the voyage home. The machine would be called the Electronic Delay Storage Automatic Calculator (EDSAC). Goldstine arranged for Thompson and Standingford to be contacted by the Cambridge group on their return to the UK. Following positive discussions, Lyons agreed to donate £3,000 in cash plus the services of an electronics technician for 1 year to support the Cambridge group in the development of EDSAC in return for advice on the company’s plans for computerisation of its data processing operation. These extra resources helped the Cambridge group to not only catch up with but to overtake the far more experienced Moore School team in the race to construct the world’s first full-scale stored-program computer. The fruitful relationship between Lyons and Cambridge continued beyond the initial 1-year agreement and when the company finally took the decision to build its own computer, it was obvious to all concerned that this should be based on EDSAC. The result was the Lyons Electronic Office (LEO), the world’s first business computer. 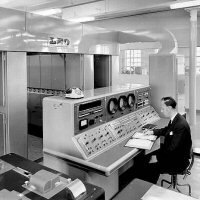 Built at a cost of £150,000, LEO featured a 17-bit word length and a clock speed of 526 KHz. 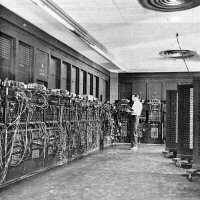 Like other full-scale computers of the pre-transistor era, LEO was the size of a room. Its electronic circuits were constructed using thousands of bulky thermionic valves and its capacious 2,048-word memory was made up of 64 individual acoustic delay lines, long cylinders filled with liquid mercury that stored data in the form of sound waves. Input and output was via punched cards and paper tape. LEO ran its first live data processing job in November 1951, calculating the value of cakes, pies and pastries for dispatch to Lyons’ retail and wholesale outlets. As one of the first electronic computers in the UK, LEO also attracted considerable attention from organisations interested in using the machine for scientific applications. Lyons was able to take advantage of this situation by making LEO available to a number of these organisations on a fee paying basis in what was probably the earliest example of a computing bureau service. LEO was conceived for internal use only but the enormous interest in the project prompted Lyons to enter the computer industry and a subsidiary company, LEO Computers Limited, was created in November 1954 to manufacture computers “for sale or hire”. LEO Computers later merged with the Data Processing & Control Systems Division of English Electric to form English Electric Leo Computers which eventually became part of International Computers Limited (ICL). On its formation in 1968, ICL was the largest non-US manufacturer of computers with a workforce of over 34,000 employees. Play to each other’s strengths. Lyons took a lead from the Cambridge group on the design of the hardware for LEO. This allowed the company to focus its efforts on developing the application software, a task which made the best use of in-house expertise in office systems. The company also subcontracted much of the construction work to other firms. Don’t be tempted to reinvent the wheel. The LEO developers did not try to create the most advanced machine possible. LEO’s conservative design was closely based on EDSAC which itself was closely based on the Moore School’s design. Proven components and subsystems were chosen over newer technologies. This combination of modest design goals and the use of readily available technology facilitated speed to market. Seconding staff can be one of the most effective methods of transferring knowledge from one organisation to another. The technician chosen for the secondment, Ernest Lenaerts, quickly became a valued member of the Cambridge group. When Lenaerts later returned to the company, the knowledge he had gained transferred back with him, making the job of building LEO much easier. If you want to read more about LEO, I can recommend the book A Computer Called LEO by Georgina Ferry. Also worth reading is Memoirs of a Computer Pioneer by Maurice V Wilkes. My own book will also cover the development of EDSAC in Chapter 5 and LEO in Chapter 6. This entry was posted in Uncategorized and tagged business-university collaboration, EDSAC, LEO on 28/04/2013 by Stephen J Marshall.